I've got a long wish list going on Amazon. I love to look through the cookbook section and see what's coming soon. I've had this cookbook, Gooseberry Patch's Big Book of Home Cooking on my wish list for several months now.﻿ I've been waiting patiently for it to be released on September 20th. I was so surprised to find out that I had been selected to review the cookbook and offer my readers a giveaway! You'll definitely get your money's worth with this cookbook. It is big - over 300 pages! You could spend hours reading through the pages and picking out which recipes to try. The book has a traditional set-up with sections on appetizers, soups and salads, main dishes, casseroles, slow cookers, desserts, cookies and candy, and gifts from the kitchen. It's filled with beautiful color photographs of many of the dishes. It really was a hard decision choosing which recipes to feature. 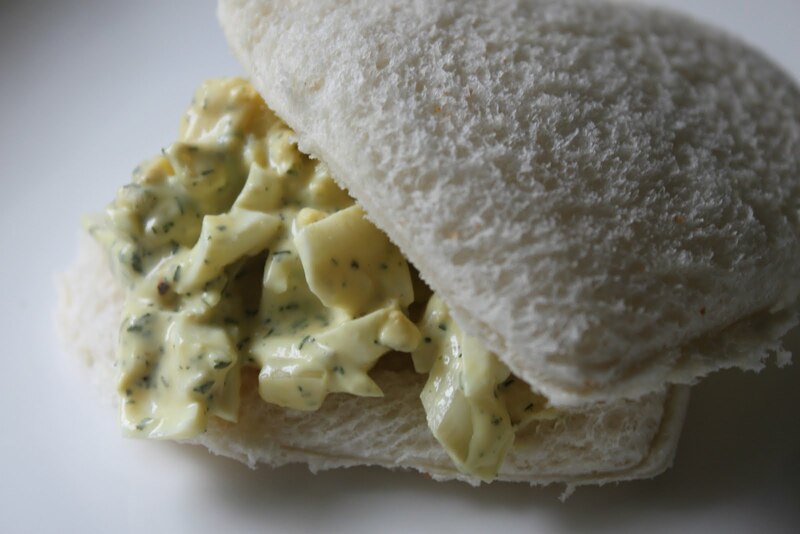 The egg salad and white BBQ sauce are unusual choices for me, but I enjoyed stepping out of my comfort zone and enjoyed the finished products. Yummy! 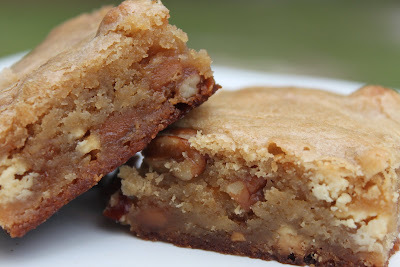 The Best Blondies fit right into my cooking style. I don't think there's anything better than a chewy, rich bar cookie. Hope you'll like these recipes, too. ﻿I am so fortunate to have been asked to review Gooseberry Patch's Big Book of Home Cooking and want to share my good fortune with you. Gooseberry Patch has sent me an extra copy to give away to one of my readers. I'm already a follower and I'm totally interested in this book. I love me some Gooseberry! Oh, how I would love this new Gooseberry Patch Cookbook!! Count me in please!! Love your blog!! I'm a new follower and I'd love to enter!! These are, by far, my favorite cookbooks! I'm already a follower and would love to enter for this wonderful cookbook! Already a follower. I love your blog and equally love GBP Cookbooks. Thanx for hosting such a wonderful giveaway. I truly interested in this cookbook! I'm a Google Friend Connect follower. I'm a follower, I love your blog! Would love to win that cookbook! That white BBQ sauce looks intriguing. I love Gooseberry Patch cookbooks and this one looks wonderful! I'm now following you on FB! Looks like a wonderful cookbook! I'd love to have one! I'm a follower, even when I should be working. :) I'd love to be entered in this contest, too. I would love to win that cookbook.Plus I am following you! I have been eying this book for some time as well! I can't wait til I get a chance to check it out. Blessings! I'm already a follower and would love a chance to win this wonderful cookbook! 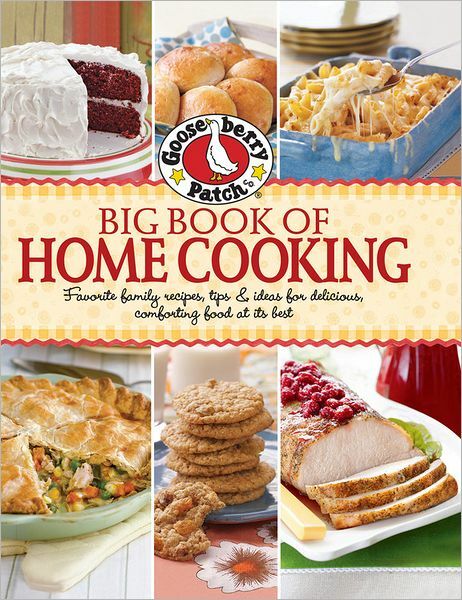 I am a follower on Facebook and would love to win this cookbook! Love it, Love it, Love it...just have to have it!!!! Roses are red, violets are blue, would love to have this book and cook something for all of you! I am a follower of you blog and I love anything that Gooseberry publishes. Thank you for the opportunity to win this wonderful book. Happy to become a follower - come follow me back! I love cookbooks, a bit of an addict, I guess. Everything looks so yummy. This is especially my kind of food come Fall! The recipes that I have tried are out of this world good. I love the pictures and the bright colors, makes me want to try something new from Gooseberry Patch. I would love to win the new cookbook. You can never, never, never have too many Gooseberry cookbooks. They become a family to you and you cannot get enough!!!! I have many, but I sure would LOVE another one.. I am interested in the cookbook! Just joined and I'm lovin it! New Follower! I love Gooseberry Patch! I'm a faithful follower and have been trying to win a cookbook! 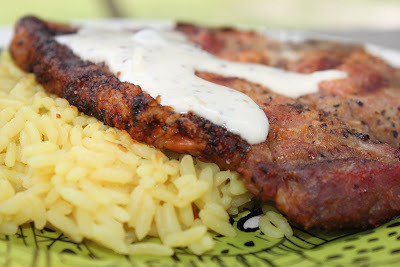 Even if I don't get a cookbook I still make the recipes the bloggers share! I am a new follower on Google. Great blog! I'd love love this cookbook! I love Gooseberry Patch! Im new to Goose Berry Patch cook books. Bought one this past weekend and absolutely love it. I have been telling everyone about it. 5 Ingredients or Less. Would love to be added to your give away. I'm following your Blog through Google Friends Connect. ...and i thought i was the only one who LOVES to read cookbooks! I'm a Google follower and would love to win this cookbook. I would love to win this new book from Gooseberry Patch! I, too, have had it on my wish list for some time now. I have been following you through GFC. I am a follower and would love to win this book. Oh, I would love a copy of this cookbook! I'm already a follower through GFC. I am a happy follower! I have been eyeing this cookbook! Keeping my fingers crossed! Now that I have found you I am a follower. Would so love to win this cookbook. My husband does not think I need it but have never found a Gooseberry cookbook that did not have good recipes and he likes to eat! I would love to get this cookbook for my collection. 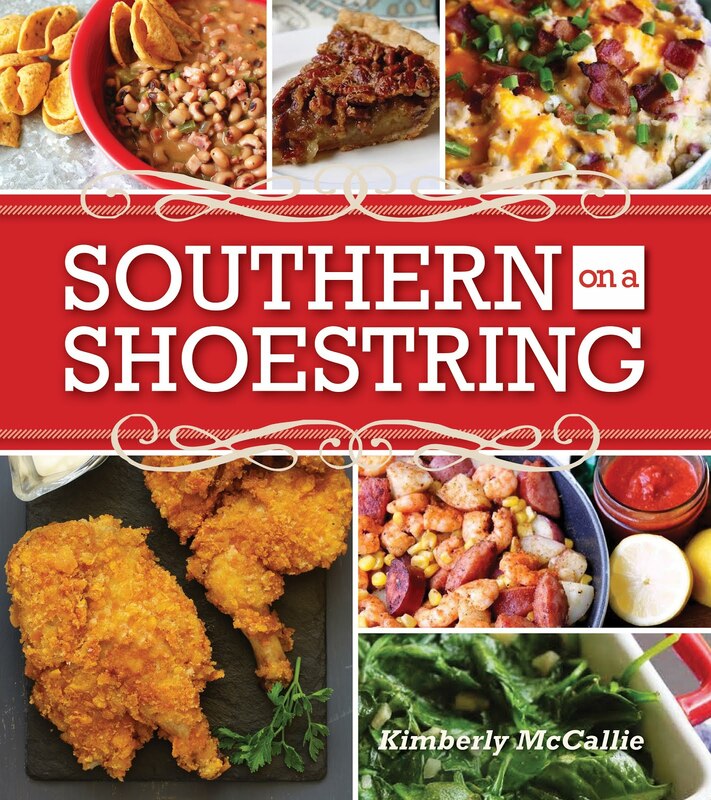 I'm following your blog, too, and would love to win this cookbook! My is bdmltm@gmail.com. I am a follower and would love to own a copy of this cookbook. Best wishes!! This book looks FABULOUS! Who knows if lightening will strike twice... I already follow your fabulous blog, so please include me in the draw! I am a follower & would love to win this amazing cookbook! Thanks for soing the give a way. I'm a follower and would love to win the Gooseberry Patch book. They are the best books ever. Following your blog through Google's Reader. Gooseberry Patch cookbooks are delightful and stuffed full of great recipes that work. This one is just in time for fall cooking. Would love to win a copy! I follow with Google Friend Connect. Would love to add this cookbook to my collection. I'm already a follower and I'm totally interested in this book. I'd love to get my hands on this cookbook! Looks like an awesome cookbook! I'm a new follower! I am a follower of your blog and thanks for the chance at this sweet cookbook! I would love to win the new Gooseberry Patch cookbook. I have several of their books and love their recipes. What a DELIGHTFUL cookbook!!! It would get lots of use in my home! I'm a follower and would love to try out this cookbook! Those blondies look amazing!!! Following and I would love love love loveeee to win this cookbook!! I love Gooseberry! I would love to win!!! What an addition to my daughters homeschool home-ec library!! I am a Cook-book-a-HOLIC!!! I LOVE this Cookbook! The Recipes Look SO YUMMY! I would LOVE to Have a Copy! New cookbook looks great!! Would love to win it and try some of the recipes with my family! Love the Gooseberry Patch cookbooks and the Christmas books are a blast too. So now I'm a follower. I'm a follower thru GFC and would love to win the cookbook! Thanks! Recipes look yummy! I follow this blog and I would love to win this cookbook. Gooseberry Patch is great! Cookbooks are my passion and Gooseberry Patch is awesome! I'm your newest follower through GFC! I love, LoVe, LOVE anything related to Gooseberry Patch! I'll admit I am not agret cook, although I would like to be.....maybe this book will help me reach my goal?! Very exciting giveaway!!! Open to Canadians? Would love a GooseBerry Patch Cookbook. I follow your blog and am loving it. I can see this cookbook becoming one of my favs! I am a new follower and I would love to win the cookbook!! I am a new follower through facebook and would love to win a copy of this Cookbook. Would SOOO Love to have this Book!!! I'm already a follower through GFC and I would love a chance to win this wonderful cookbook!! Thanks for the opportunity! Fall and winter are my favorite seasons for trying out new recipes!!! Hoping I win!! New to your blog. *love* it. Love the cookbook as well. :). Gooseberry Patch sent me to your blog from facebook. This cookbook looks amazing and I would be so excited to win it. I'm now a follower of your blog and think I'll grab a cup of coffee and browse it a bit. I am a follower and avid gooseberry patch cookbook collector. would love love this one. I am now a follower and would LOVE to have this book! When I get to spend an evening by myself, I always try new recipies. This cook book would be perfect for me!!! Hope I'm not posting twice...I'd love to win the cookbook..it might help chase away the September blahs.. I just became a "follower" but have no idea how to make a comment on your blog. But, I would LOVE to win the BIG Cookbook! I also am going to try some of your recipes ... starting with the Snickerdoodle Brownies! I would love to have this cookbook as my own. I love to cook for family and friends. I'm following! Sounds like a great book. just became a follower, love poking through new recipes. I love Gooseberry Patch books! Any opportunity to own another one would be fantastic. Thanks! I am following your site through Networked Blogs and the cookbook looks wonderful! I admit, I am a compulsive cookbook buyer and follower. I love reading cookbooks and trying out new recipes! I'm following, would love to have this book!! I would love, love, love to win this book!! Great giveaway! Sign me up for the cookbook! I am following you on Google! I'm a follower! Would love to have this cookbook. 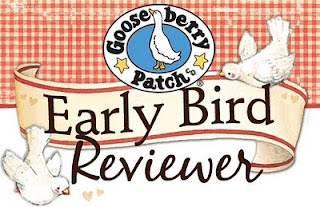 I've been a fan of Gooseberry Patch for a long, long time and have several of their books. They are the best!!! I've been a follower and would love to try and win this wonderful cookbook! Please enter my name. Thanks. Oops, I forgot to give my e-mail address with the comment before: songgirlc@yahoo.com. Thank you!!! hi I'm a follower and I cook for me 87 year old fathrt and I have a hard time pleasing him as he's a very picky eater ....I know he would love you recipes. I have very picky kids and they actually like the things we have made. I would love to be able to have this cookbook to add to my collection and keep my kids eating good foods!!! We love it. Thank you so much for the opportunity to try out a new cookbook. My email is seenred40@gmail.com. 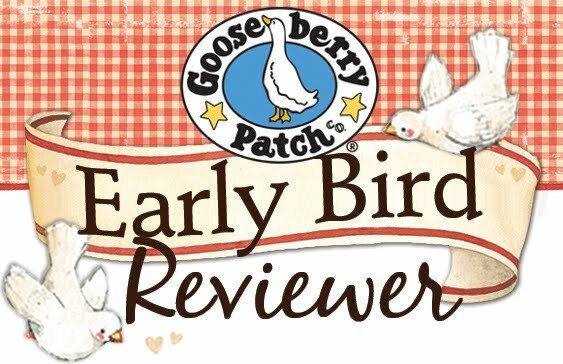 Kim thanks for reviewing the New Gooseberry Patch Book - and offering this giveaway - it connected me to your blog and offers me the opportunity to obtain this new Gooseberry Book when released. I'm a follower....Thanks for the great giveaway I would LOVE to win this Cookbook!! Would love to have your cookbook!!! I follow your blog through Google Friend Connect. Would love to win the cookbook! I've been following on facebook, but now I'm your newest google connect follower. Thanks for the opportunity to enter this great contest. I'm pretty new to the world of Gooseberry Patch, but they recently notified me that they'd be publishing one of my blog recipes in an upcoming book. I can't tell you how excited I am. PS - I don't share my personal email online, but you can contact me through my blog if I win the giveaway. I would love to win the cookbook. I love trying new recipes. I would love to have your cookbook have already tried some of the recipes they are delicious. Very happy with the recipes and would truly love to add this to my collection. I love to find new recipes to try. Many blessing to you and your family. Thank you so much. I am a NEW follower...your blog looks great! I would love to win the cookbook. Gooseberry Patch is one of my favorite recipe providers!